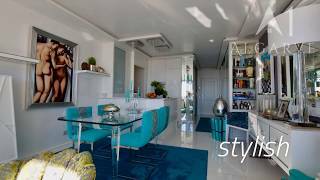 Stunning 9th floor, 80 sqm studio apartment for sale in Vilamoura centre. Beautifully designed interior and with sea views. What the current owners like about this property the most: "To sit on the terrace with a glass of wine in the evening looking over the town and sea"
Stunning 9th floor, 80 sqm studio apartment in Vilamoura.The studio is 80 sqm and has sea views. It has been beautifully designed inside with top of the range appliances in the kitchen and a contemporary bathroom with rain shower. Underfloor heating has been fitted throughout. There is an integrated sound system, electric blinds with blackout and an open fireplace with ethanol gas. There is also an extendable sofa for a 2x2m double bed.